It’s not unusual for children to get a mild fever. So it’s good to feel sure about what’s normal and be confident you can tell when your little one is definitely unwell. From taking their temperature to doing all you can to bring down their fever, there’s lots of ways you can help your child feel better. When it comes to a ‘normal’ temperature, every young child is slightly different. Your little one’s temperature range can vary quite widely, and go up and down quickly as their body hasn’t yet worked out how to control how hot they get. Generally, if they have a temperature above 37.5°C, then it’s classed as a fever. How do I know if my child has a high temperature? Your little one may look flushed or hot, but to be sure that they have a temperature, you’ll need to use a thermometer. To get a fast and accurate reading it’s best to use a digital thermometer. If your child is under 5, you should take their temperature under their armpit not under their tongue, as you’ll get a more accurate result. 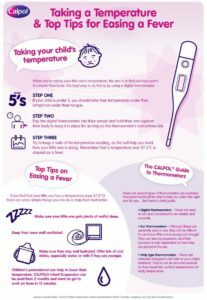 Pop the digital thermometer under their armpit and hold their arm against their body for as long as the thermometer’s instructions tell you (keep watch or they may try and play with it!) Try to keep a note of the reading as this will help you track how your little one is doing. Remember, any temperature above 37.5°C is usually classed as a fever. If your child is distressed, you can use a paracetamol-based medicine to reduce a fever. CALPOL® Infant Suspension, which contains paracetamol, gets to work on fever in just 15 minutes. It’s suitable for most babies from 2 months. Make sure your child gets plenty of restful sleep. Try not to overheat your house. Your child should be more comfortable in a well-ventilated room at a normal temperature. Your child might lose their appetite – this should only last a couple of days. Just let them eat when they are hungry. Make sure they have plenty to drink. If they have started eating solid food, offer lots of cool drinks, especially water. When your little one is suffering from a fever, it can be a sign that their body is fighting an illness, like an ear infection, the flu, or chickenpox. So it can last for anything from a few hours to a few days, depending on what they’re fighting off and how poorly they are. Although it can be hard to see your little one feeling so hot and bothered, most fevers will soon clear up. as well as a fever, your child has other signs of being unwell, such as floppiness, drowsiness, persistent vomiting or refusal to feed.